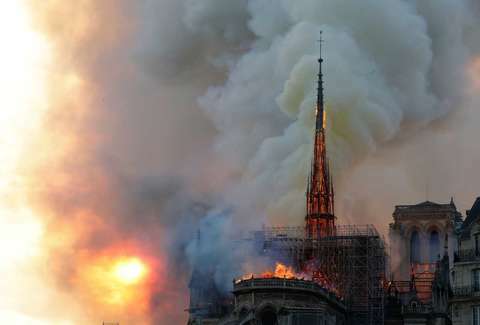 The "worst has been avoided,” said French president Emmanuel Macron on Monday evening, after firefighters spent hours fighting a ruinous fire ripping through Paris’ iconic Notre Dame Cathedral. While the 850-year old church’s spire and ceiling collapsed, two additional towers have been saved. One firefighter is reported injured. The extent of the remaining damage is not yet known. According to a tweet from Reuters and attributed to a fire official, “The structure of Notre-Dame has been saved from total destruction.” Meanwhile, French journalist Nicolas Delesalle ‏tweeted, “Good news: all the artworks have been saved. The treasure of the cathedral is intact, the crown of thorns, the holy sacraments.” As of publication, it remains unclear what else has been saved. BREAKING: Structure of #NotreDame has been saved from total destruction, a French firefighter official is quoted by @Reuters saying. The cause of the fire is still unknown, but likely related to the ongoing $6.8 million reconstruction project, with preliminary reports saying officials are treating the fire as an accident. Scenes of the destruction played out across social media and multiple news outlets as onlookers gathered safely around the building, while an estimated 400 firefighters worked to control the blaze. “Everything is burning, nothing will remain from the frame,” said Notre Dame spokesman Andre Finot, reported by multiple outlets earlier in the evening. The Associated Press reported that Paris’ Deputy Mayor Emmanuel Gregoire said first responders were making efforts to salvage whatever art and historic pieces they can. As previously reported, most -- if not all -- of the centuries-old cathedral's roof has collapsed, along with its iconic spire. Unconfirmed reports state that the three medieval rose windows exploded from the heat, The Guardian reported. Firetrucks initially could not reach the scene, the isolated Ile de la Cité, due to late-day traffic. As the iconic 19th-century central spire collapsed, onlookers filmed the scene and sang hymns. Notre Dame sees an estimated 13 million visitors a year, anywhere between 30,000 and 50,000 people daily, making it Paris’ most touristed site. Joseph Hernandez is Thrillist's senior travel editor. Email him travel news, tips or recommendations at jhernandez@thrillist.com.